Newtec does it again, as a company that is recognized as a specialist in designing, developing and manufacturing equipment and technologies for satellite communications – has renewed its ‘Factory of the Future’ status as it was handed a prestigious manufacturing accolade for the second time. Newtec was one of four companies that received the award in its inaugural year in 2015. 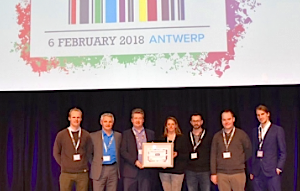 After demonstrating its people-first culture at its Manufacturing Competence Center (MCC), in Erpe-Mere, it was recognized for the second time as one of Belgium's leading manufacturing companies. This recognizes a number of changes the factory has undergone over the last two years as it follows and lives the Industry 4.0 trend. Developments include the doubling of the production capacity, a greater emphasis put on staff involvement and a rise in efficiency due to technological investments. Newtec credits its success to its manufacturing workforce, which is encouraged to contribute ideas at all levels and play a part in the evolution of procedures and processes within the factory. This openness creates a strong sense of unity amongst workers and a people-centered foundation for operations. Digitization is the second contributing factor to the success of Newtec’s manufacturing output as the efficient digital processing of orders has enabled a surge in growth and a greater working efficiency on the production line. Through making a number of strategic technological investments, Newtec has been able to double its production capacity in recent years, maintaining its world-class production status and entering new markets such as maritime and In-Flight Connectivity (IFC). Guy De Winne – Plant Manager and Director Manufacturing Operations stated that after doubling their production capacity in 2015 they are today again multiplying their production capacity by investing in the latest equipment and recruiting a lot of new employees after already increasing their workforce with 40 percent in 2017. When future-proofing any organization, it is challenging and fascinating at the same time. The workforce, technology, tools and customer demands are constantly evolving as they refocus on the changes that the markets experience. This award is a great tribute to their team as their input is integral to their success. The ‘Factory of the Future’ award is the highest possible recognition for the manufacturing industry in Belgium, requiring a high level of performance in different transformations toward ‘Industry 4.0,’ as defined in the ‘Made Different’ project originally deployed by Agoria, the Belgian federation for the technology industry, and Sirris, the collective center for and by the Belgian technological industry. Danny De Smet, Business Development at Newtec’s Manufacturing Competence Center. stated that over the last decade the manufacturing facility has successfully put its focus on the efficient delivery of high quality products for industry, defense and aerospace markets while remaining customer oriented and that receiving the award in 2015 was the first confirmation that they had become 'a reference' in the industry and transformed ourselves into a preferred manufacturing partner for technology companies. This award renewal and its market recognition confirms their leading position as electronics manufacturing experts, ensuring a very high-quality standard to their customers, partners and their customers.